Bigg Boss 11 Winner Name and Grand Finale Live Updates: The time has come for the Big Boss 2018 to announce the BB11 winner’s name tonight. It’s going to be the biggest night of season 11 of BiggBoss with Salman Khan in the Weekend ka Vaar. The elimination of Akash Dadlani paved the way for the four finalists. 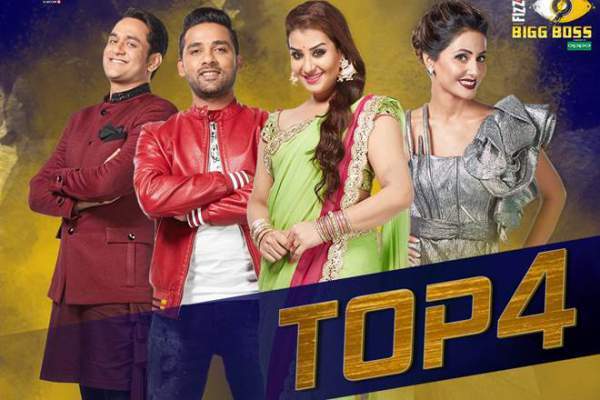 Shilpa Shinde, Hina Khan, Vikas Gupta, and Puneesh Sharma became the top 4 contestants for the coveted trophy. Akash got evicted in a mid-week elimination round. Until everything goes official, everyone is up with their predictions and speculations on who will win and be the Bigg Boss 11 winner. It’s no brainer that Shilpa and Hina are giving each other a tough competition. Salman Khan will reveal the name of Bigg Boss 2018 winner as the show comes to its end for the season. Until everything is revealed, follow the live updates below. 11:35 PM: Shilpa Shinde has been declared as the Bigg Boss winner 2018. She won BB11. 11:05 PM: Hina performs with Luv Tyagi and Priyank Sharma, and entertains everybody. 11:00 PM: Audience gets one more chance to vote between Shilpa and Hina, for the winner. 10:48 PM: Vikas Gupta gets eliminated. It leaves the two ladies in the top 2. Hina vs Shilpa, who will win the title this year? 10:30 PM: Salman has planned a fun activity with Akshay. 10:15 PM: Puneesh and Bandagi presented their performances and set the stage on fire. 10:14 PM: Eliminated participants Hiten and Arshi get interested in mike drop competition. The host also does some rhyming. 10:13 PM: Vikas Gupta’s fans will get a huge setback if he gets eliminated. 10:02 PM: There are reports that Vikas Gupta will get evicted. It means that Hina and Shilpa will be the final competitors. 9:50 PM: Puneesh Sharma is evicted officially. 9:38 PM: Akash Dadlani entertained the audience and house members with his non-stop performance. 9:35 PM “@ipriyanksharmaa chooses @lostboy54 over @eyehinakhan to become the winner of #BB11. Do you agree with his choice? #BB11Finale,” Colors tweeted. 9:34 PM: Dhinchak Pooja presented her latest hit song, Bewafa as Salman Khan requested her for it. 9:31 PM: All the BiggBoss 11 contestants (finalists and eliminated) meet one another in the BB11 finale. 9:29 PM: A twitter handle @BiggBossNews has claimed that Shilpa Shinde has won and defeated Hina Khan. 9:22 PM: Salman said each one of the contestants is a winner according to him. 9:12 PM: The host engages in some fun moments and conversations with the evicted participants. 9:08 PM: Tiger Zinda Hai star made every housemate and audience go down the memory lane and revisit some funny moments. 9:08 PM: Salman Khan introduces the four finalists in his unique style. 9:00 PM: It’s the time for Bigg Boss 11 (winner) finale. Salman starts the show with Tiger Zinda Hai style.